Celebrating the sense of touch, the Lady is seen here caressing the unicorn's magical healing horn. Her other hand holds the pennant pole of the flag of the le Viste family crest. With flying pheasants, partridges, and dogs among the animals in the stylised decorative background known as thousand flower, the scene uses elements from nature to decorate the scene. 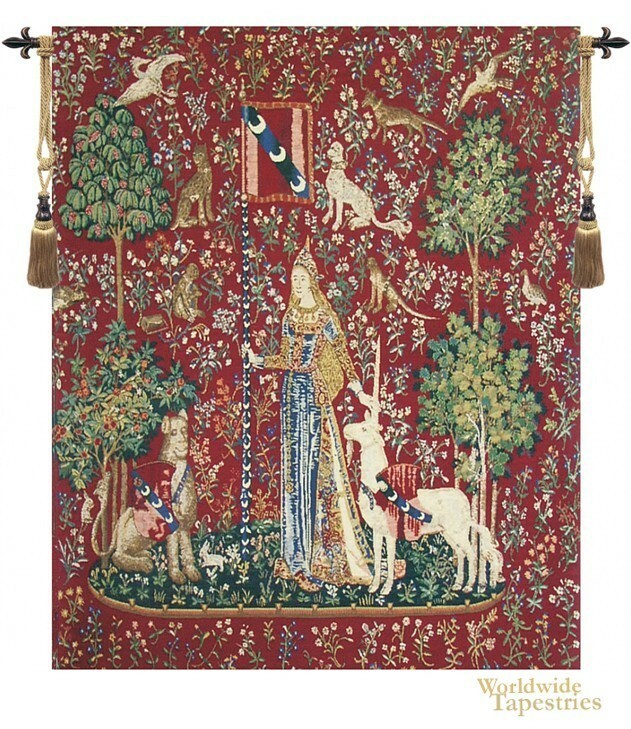 This unicorn art tapestry Touch (Lady and Unicorn) is backed with lining and tunnel for easy hanging. Note: tapestry rod and tassels, where pictured, are purchased separately. Dimensions: W 33" x H 42"
Dimensions: W 62" x H 69"